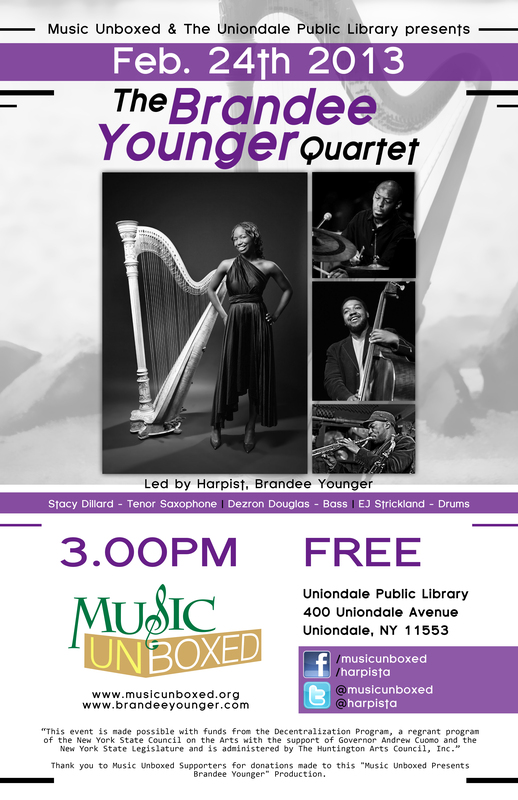 Music Unboxed collaborated with the Uniondale Public Library this past Sunday, February 24, 2013 to produce a show in celebration of Black History Month featuring Long Island Harpist, Brandee Younger and her Jazz Ensemble “The Brandee Younger Quartet”. The soulful sounds of Harpist, Brandee Younger leading a band of world renowned jazz musicians in her hometown of Uniondale, filled the hearts of our beautiful audience. The featured musicians in Ms. Younger’s band were Stacy Dillard on soprano saxophone, Rashaan Carter on bass, and EJ Strickland on drum set. Local music students from the Uniondale High School Jazz Band and the Jr. Friends of the Uniondale Public Library had the opportunity to spend an hour with The Brandee Younger Quartet prior to the concert for a student workshop where they prepared to perform the Miles Davis tune “So What”. After the students played a surprise second tune with many beautiful jazz solos, Brandee Younger stated that a wave of inspiration must have occurred between the workshop and concert in that they went far and beyond in performance! Special thank you to Mr. Colton Wynter and Mr. Ellis Holmes; the full-time band directors at the Uniondale High School. This event is made possible with funds from the Decentralization Program, a regrant program of the New York State Council on the Arts with the support of Governor Andrew Cuomo and the New York State Legislature and is administered by The Huntington Arts Council, Inc. This event was also made possible by donations from Music Unboxed Supporters. It was via these donations and the grant from New York State that this concert was offered for free admission to all. This first Music Unboxed show of our 2013 “There’s No Place Like Home” Concert Series was a success! THANK YOU to all those who attended, the Uniondale Public Library, The Brandee Younger Quartet, the wonderful Uniondale student participants, Huntington Arts Council, The New York State Council of the Arts, and all those who donated to make this concert possible! Our Music Unboxed Team looks forward to featuring more Long Island musicians in their hometowns for our 2013 “There’s No Place Like Home” Concert Series! Stay updated on our future events by joining our mailing list! Click here for information on how to make a contribution.